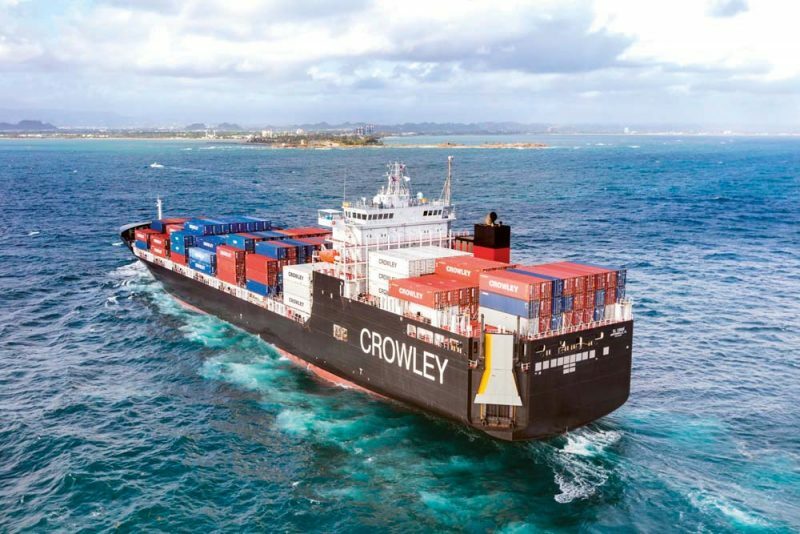 Crowley Maritime Corporation, a multipurpose shipping, logistics, salvage, engineering and offshore company based in Jacksonville, Florida, operates a Lo-Lo/Ro-Ro Liner service between Jacksonville, Florida, U.S.A and San Juan, Puerto Rico. Until recently this has consisted of a fleet of 10 large triple deck barges being hauled by ocean-going tugs. Their cargo capacity has been up to 398 FEU or equivalent units per vessel. The company also operates a fleet of 15 Lo/Lo container vessels internationally with varying TEU capacities. The company can trace its routes back to 1892 when Thomas Crowley bought a Whitehall rowing boat and went into business for himself shuttling personnel and supplies between the San Francisco waterfront and the tall sailing ships that would anchor in San Francisco Bay. From these humble beginnings grew the company that is Crowley Maritime Corporation. The operation now encompasses many elements of the maritime industry, and more besides. The present structure, in which Crowley Maritime Corporation serves as a holding company for business lines and all subsidiaries, was put in place in 1992. The company is wholly and privately owned by the Crowley family and Crowley employees. The six operating lines of business are: Puerto Rico/Caribbean liner services; Latin America liner services; logistics; marine contract solutions; deep sea petroleum transportation; and petroleum transportation plus distribution and sales in Alaska. Notable achievements in recent years include the first licensed commercial cargo delivery directly from the U.S.A to Havana, Cuba, in nearly 40 years on 16th December 2001. That operation continues to this day. The year 2017 marked 125 years of business for the company and 2014 saw Crowley celebrate its 60th anniversary of service to the people and businesses of Puerto Rico. It is this operation that the newbuild focusses on as it enters a new era. It was back in February 2012 that Wärtsilä Ship Design (WSD) received an inquiry for a very high specification container Ro-Ro vessel for Crowley Maritime. The Ship Building Contract could have been signed before the summer of 2012, but given the novelty of the design linked to the use of relatively new LNG technology, Crowley Maritime wanted to ensure that all possible foreseeable risks were mitigated before the contract was finalised. So, in November 2013 Crowley Maritime Corporation placed the order with VT System’s subsidiary VT Halter Marine for two WSD84 2400 WD LNG ConRo (Combination Container Ro-Ro) ships for an estimated contract value of $350m.The newbuild project was officially confirmed on 1st January 2014 and, dubbed the Commitment (C) Class, the order heralded the start of a mission to modernise the company’s Jacksonville-San Juan (Puerto Rico) Liner Service after 6 decades. The name Commitment Class was chosen to represent Crowley’s commitment to the Puerto Rico Trade, but it was also a fitting tribute to the commitment from firms such as DNV GL, who helped the company design and deliver a safer, smarter, greener class of ships. Since the beginning of the 1970s Crowley had employed triple deck barges towed by tugs but such a practice has become somewhat dated in the modern-day deep-sea shipping world. This U.S Mainland to Puerto Rico service is the largest domestic (Jones Act) liner trade and, pre-2018, the fleet consisted of four 730-unit capacity and 2x 580-unit capacity triple deck Ro-Ro barges handled by Invader Class Tugs, sailing three times per week from Jacksonville, Florida, and once per week from Pennsauken, New Jersey. The fleet age, the new regulations and the increasing business potential were the main drivers for Crowley looking ahead of its competition and beyond the currently employed shipping practices to create a new fleet of vessels. Shipping companies in the U.S.A are obliged to adhere to the Jones Act, a federal law that regulates maritime commerce in the United States of America. The Jones Act requires goods shipped between U.S. ports to be transported on ships that are built, owned and operated by United States citizens or permanent residents. Also known as the Merchant Marine Act of 1920, the law is vitally important to maintaining a strong U.S. maritime capability. So, Crowley had set the wheels in motion for the very first LNG powered, American flagged, Container Ro-Ro ships.